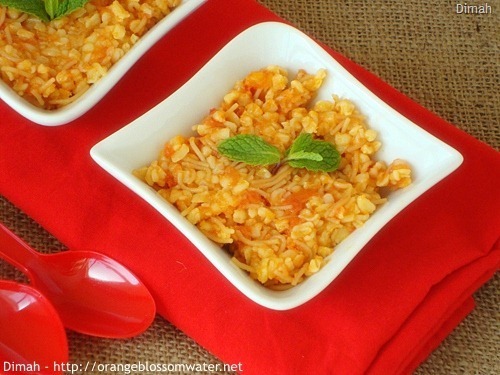 Burhgul Bel-Bandourah is a healthy and light dish prepared from tomatoes, bulgur, onions, and olive oil. 2, 3, 4. 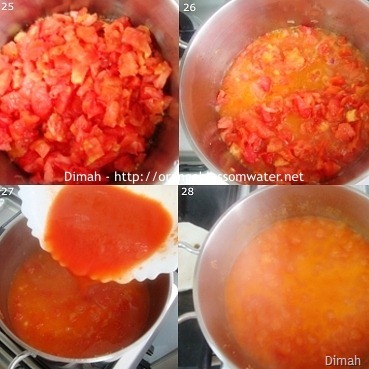 Peel tomatoes completely, there is no need to use the method of boiling tomatoes then peeling them, it is very easy to bring a knife and peel tomatoes without boiling them. 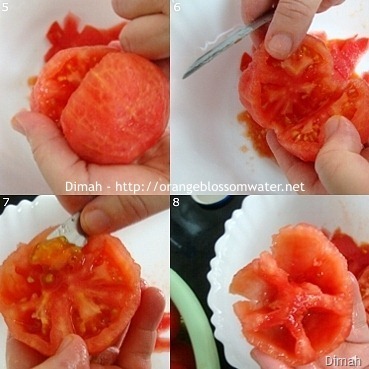 Do not discard tomato skins. 7, 8. Remove seeds, and do not discard the seeds. 9, 10, 11, 13. Cut tomatoes into chunks, and set aside. 13. These are the tomato skins and seeds, put them in a deep pot, and add salt to them. 14. Bring them to boil over medium heat for 30 minutes. 15. After 30 minutes, strain and squeeze until you get all the juice out. 16. After straining, save the juice, and discard the skins and seeds. 17, 18. 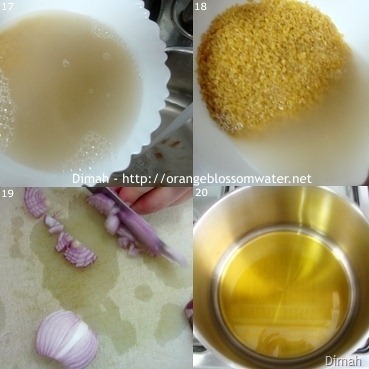 Prepare coarse white bulgur wheat, rinse in several changes with water, and set aside. 19. Chop onion into small pieces, and set aside. 20. Fill a deep pot with 150 ml olive oil. 21, 22, 23. Turn on heat, and add vermicelli and stir until golden brown in color, then remove fried vermicelli from oil and keep it aside. 24. To same olive oil, add chopped onion, and stir until transparent. 25, 26. To the pot that contains olive oil and onion, add tomato chunks and cook over low heat until tomatoes release water. 27. Now, add the juice that you saved in step 16. 28. Bring the mixture to boil over high heat, then cover the pot and cook over low heat until tomato is cooked, soft and tender. 29, 30. Once tomato is cooked, add bulgur and vermicelli (tomaotes should be boiling before adding the bulgur and vermicelli), stir then taste and add salt if needed, and allow to boil for few minutes then cover the pot and keep over low heat until bulgur is cooked, it took about 20 – 25 minutes. 31. If the bulgur is cooked and you noticed that the bulgur didn’t absorb all the liquid, so just turn off heat and cover the pot and keep until all liquid is absorbed. 32. At this point, the dish is ready. 33. Sprinkle with black pepper and serve warm or cold with green pepper. 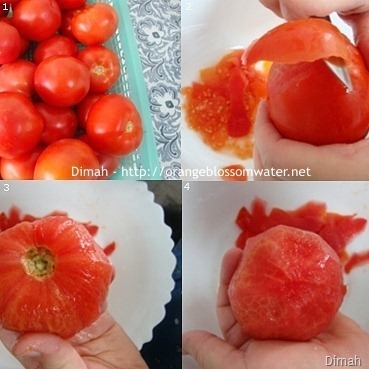 Peel tomatoes completely, there is no need to use the method of boiling tomatoes then peeling them, it is very easy to bring a knife and peel tomatoes without boiling them. Do not discard tomato skins. Remove seeds, and do not discard the seeds. Cut tomatoes into chunks, and set aside. These are the tomato skins and seeds, put them in a deep pot, and add salt to them. Bring them to boil over medium heat for 30 minutes. After 30 minutes, strain and squeeze until you get all the juice out. After straining, save the juice, and discard the skins and seeds. Prepare coarse white bulgur wheat, rinse in several changes with water, and set aside. Chop onion into small pieces, and set aside. Fill a deep pot with 150 ml olive oil. Turn on heat, and add vermicelli and stir until golden brown in color, then remove fried vermicelli from oil and keep it aside. To same olive oil, add chopped onion, and stir until transparent. To the pot that contains olive oil and onion, add tomato chunks and cook over low heat until tomatoes release water. Now, add the juice that you saved in step 16. Bring the mixture to boil over high heat, then cover the pot and cook over low heat until tomato is cooked, soft and tender. 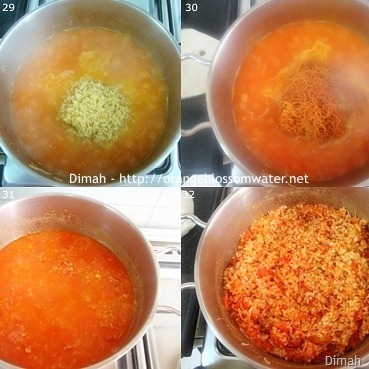 Once tomato is cooked, add bulgur and vermicelli (tomatoes should be boiling before adding the bulgur and vermicelli), stir then taste and add salt if needed, and allow to boil for few minutes then cover the pot and keep over low heat until bulgur is cooked, it took about 20 -25 minutes. If the bulgur is cooked and you noticed that the bulgur didn’t absorb all the liquid, so just turn off heat and cover the pot and keep until all liquid is absorbed. At this point, the dish is ready. Sprinkle with black pepper and serve warm or cold with green pepper. This entry was posted on Tuesday, January 18th, 2011 at 6:40 PM	and is filed under Syrian Cooking. You can follow any responses to this entry through the RSS 2.0 feed. You can skip to the end and leave a response. Pinging is currently not allowed. Bulgur isn’t such a common pantry staple for me, but I’m always happy to have more ideas on using it. I really like the idea of combining it with a bit of pasta, so it won’t be such “roughage”, as my parents would say. Dimah, Your photos are not only beautiful (always so crisp, so clean, so lovely), they are also incredibly helpful. Thank you for another wonderful recipe and for the great tip of not using the blanching method for peeling the tomatoes for this dish. Perfect! 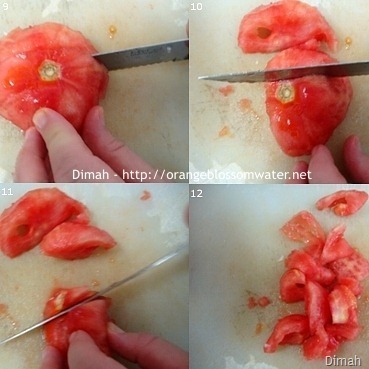 Burghul is so healthy and delicious..
wow Dimah.. i think i just learned how to cut a tomato in a new way. 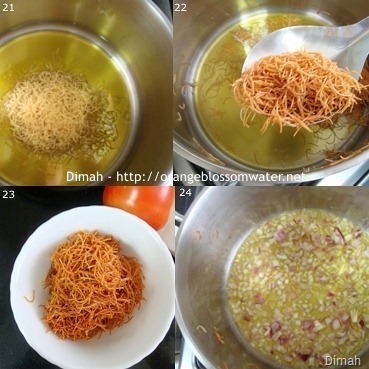 Dimah you always have such interesting dishes and love your step by step. this is another must try dish for me…fabulous..
What a wonderful use for bulghar wheat. I buy it to make tabouli, but I’ve never used it for anything else. The ingredients sound so fresh and gorgeous.I love the bright pictures u have taken. I am going to try this dish, looks delicious. Nice and healthy easy recipe. This looks amazing! Healthy too! Burghul looks delicious with tomatoes. I don’t typically cook it with tomatoes but I think I will after seeing this. Oh Dimah, you always have hit posts, and this one is no different! Stunning photos, and wonderful recipe! Thankyou for the very detailed recipe! :) And this is a great idea to use up the bulghur-I buy it as a big bag and I usually use it for tabouli so I go through it so slowly! Dish looks nice. Do you eat it as a main dish or with something? 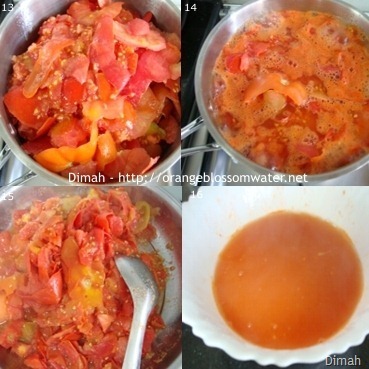 Dimah, this is a delicious, flavourfoul and healthy dish! Great clicks, too! My Lebanese friend once made this for me – it was delish! enchallah try your recipe Dimah! Sounds healthy and yummy though I never tried bulghur so far, thanks for the tip too…. This looks so good! I really like the presentation of it in those adorable dishes. Really look forward to making this. Great Blog!! this dish sounds very good. love that you added vermicelli to it. thanks for sharing this!! 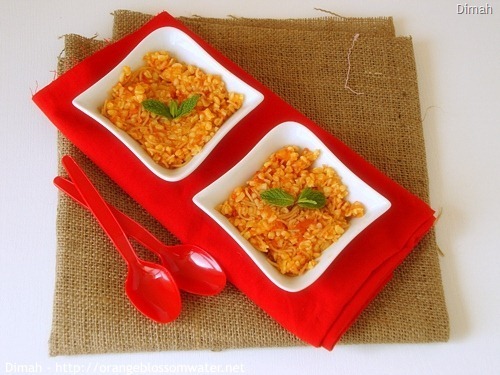 Wonderful recipe for one of my favorite bulgur dishes! I dont use vermicelli but I love the idea. What a beautiful light and healthy dish! Just the thing I’m craving lately. That is one superb recipe, loving your presentation..
it looks completely delicious. Never cookes burghul, but I guess I need to try! 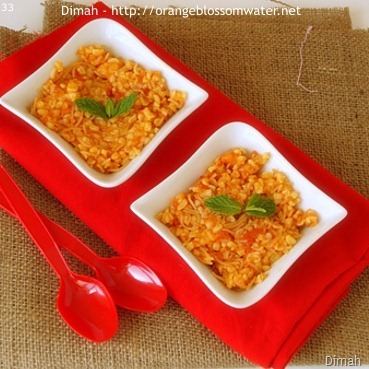 Dimah, this bulgur recipe is awesome!! And your photos are merely gorgeous! Sometimes from simple ingredients come the most tasty dishes. I love the colors. Another great recipe that I am itching to try out. hehe. Your presentation is stunning! I LOVVVVVVEEEEE your pictures. They are always so crisp! I wish I could enjoy this today! What a beautiful and delicious dish! I love the simplicity of it! I could stare at your pictures all day long. Wonderful dish… so lovely presentation.. never combined bulgur and vermicelli … worth a try..thanks for sharing this. I love your presentation and pictures as well as your wonderful dish! wow..this is such..healthy n yummy dish..n v interesting too!..lov d pics as usual! This sounds like a delicious dish with the mix of bulghur and vermicelli. And, I always love tomatoes! this is a lovely recipe– bookmarked ! I’ve always wanted to try bulgur wheat and this looks like a particularly delicious way to do so! 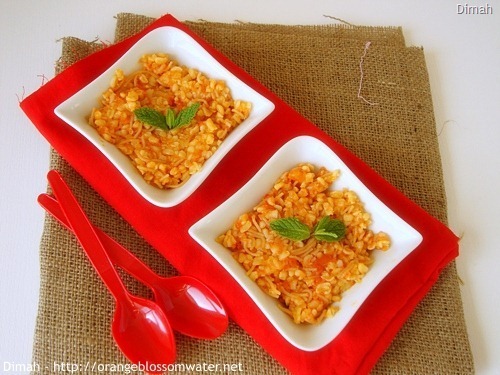 i prefer bulgur to rice (shhh, don’t tell my husband) and your dish sounds so good. I have to give it a try soon. Looks and sounds amazing! I can imagine the intense tomato flavours in this! One of my favorite dishes, but i never tried it with vermicellli! I love burghul and this dish looks so healthy and satisfying. beautiful! though i have no idea what bulgur is, this looks appetising. thanks for coming by my blog earlier. will visit here often. have a nice weekend! Victoria Challalncin: Thank you so much for stopping by and for the kind comment! Shima: Thank you so much! Ananda Rajashekar: Thank you very much! Tanvi@SinfullySpicy: Thank you so much for the wonderful comment! Mateja: Thank you so much! Sandra: Thank you so much for the lovely comment! Lorraine @ Not Quite Nigella: Thank you so much, dear! you have to notice that in tabbouleh we use fine bulgur, and in this recipe it is coarse bulgur. Alicia@ eco friendly homemaking: Thank you so much! blackbookkitchendiaries: Thanks for coming by! Joanne: Thanks for stopping by! Cook is Good: Thank you so much! Mina @ Angellove’s Cooking: Thank you! Cakewhiz: Thanks for stopping by and for the kind words! Reeni: Thanks for stopping by! lisaiscooking: Thank you so much! A little bit of everything: Thank you so much! Namitha: Thanks for the kind comment!